Mr. Ferguson may or may not have actually said this. But we can say for sure that statements of this kind, most readily sourced to foreigners, have been leveled at “the West” and “Western media” for decades. 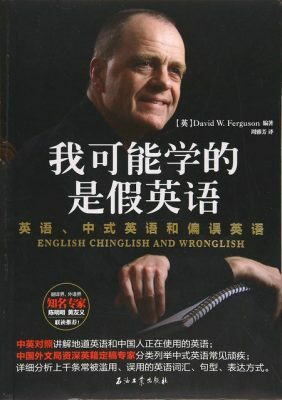 The cover of a book on the English language written by David Ferguson, a member of the team that translated Xi Jinping’s book, The Governance of China. Way back in March 1949, six months before the founding of the People’s Republic of China, the People’s Daily ran an article called “Talking About America’s News Industry” (谈谈美国的新闻业). 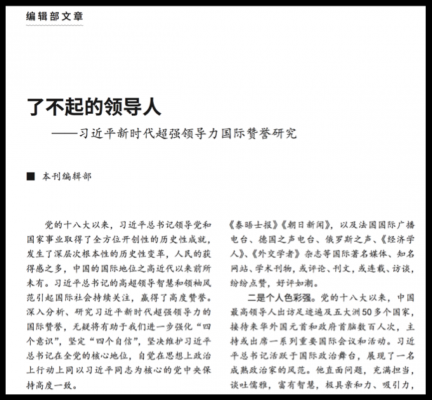 Written by Huang Caoliang (黄操良), the head of the paper’s international news desk at the time, the article argued that journalism and press freedom in the United States were undercut by capitalist ownership. To support his case, Huang recycled a single American author critical of contemporary media barons. But while the theme of Western bias is sure to persist out of ideological force of habit, it seems that some minds within the Party couldn’t be happier with the treatment China and its powerful leader have received in the West (and in the rest) since the 18th National Congress of the CCP was held in November 2012, and since a cascade of shocks, from Brexit to the Trump presidency, have upset expectations of global leadership. The most recent edition of the Central Party School’s journal China Leadership Science pushes for systematic study of praise for Xi Jinping overseas. The term “super-strong leadership,” or chaoqiang lingdaoli (超强领导力), is a term that first emerged back in January this year at a “theoretical research conference” held by the China Leadership Science Academy (中国领导科学研究会), the organization within the Central Party School that publishes China Leadership Science. We will have to watch and see how and whether the term continues to be used in the official discourse. The editors of China Leadership Science seem more interested in cherry picking than systematic research when it comes to international coverage of Xi Jinping. But there can be little doubt that these are interesting times in terms of the reshaping of global narratives of leadership. Since the Party’s 18th National Congress, General Secretary Xi Jinping has made comprehensively pathbreaking and historic achievements in leading the Party and the country, there has been a deep and fundamental historical transformation (变革), the people feel they have gained a great deal, and China’s international standing is now at a high not seen in modern times. The superlative (高超) leadership wisdom (智慧) and leadership style (领袖风范) [of Xi Jinping] has consistently drawn attention from international society, earning a high level of praise. Deeply studying the international praise for Xi Jinping’s super-strong leadership (超强领导) in the New Era will no doubt benefit us in further strengthening the “Four Consciousnessess”(四个意识), in persisting with the “Four Confidences” (四个自信), and in determinedly preserving General Secretary Xi Jinping’s core status (核心地位) throughout the Party, so that in our ideas, politics and actions we may willingly maintain a high level of uniformity with the Central Party of which Comrade Xi Jinping is the core（高度一致). First, the variety of media. International society’s praise for General Secretary Xi Jinping’s super-strong leadership perhaps includes all forms of media — for example specialized books, research articles, newspapers, magazines, radio, television, online commentary, etcetera. Relatively representative books include Xi Jinping’s Leadership (习近平的领导力), [Yuri Tavrovsky’s] Xi Jinping: The Chinese Dream (习近平 :正圆中国梦), The Age of Xi Jinping (习近平时代), Great Power Leader Xi Jinping (习近平复兴中国), Great Nation Leader Xi Jinping (大国领袖习近平). Aside from these, the New York Times, the Washington Post, the Wall Street Journal, the Times, Asahi Shinbun, Radio France Internationale, Deutsche Welle television, Voice of Russia (俄罗斯之声), the Economist, The Diplomat and other well-known international media, recognized websites or academic publications, whether through commentaries, essays or excerpts and interviews — all have offered their praise, giving rave reviews. Second, the strength of personality (个人色彩). Since the Party’s 18th National Congress, China’s president has visited more than 50 countries on five continents, has received hundreds of visits from foreign heads of state and other government officials, and has hosted or appeared at a series of important international conferences and events. General Secretary Xi Jinping hs been active on the global stage, serving as a model of the mature political leader. He faces problems head on, taking them on personally, showing wisdom amid the confusion, inspiring affinity and attraction, continually drawing the attention of others wherever he goes, becoming the focus of discussion. His representative work, Xi Jinping’s Governance of China, has already spread across the world, so that in the case for example of the United States, libraries having the book exist in every state, covering essentially all public libraries and community libraries. The praise of international society for Xi Jinping’s leadership is not limited only to the realm of politics but has already become a matter of personal will for many people. Third, there is the sustained time period [of praise for Xi Jinping]. 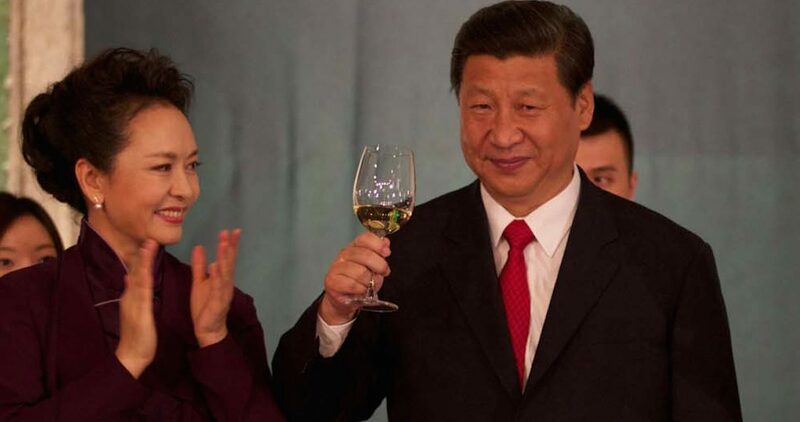 Beginning with the opening of the 18th National Congress in 2012, the praise for Xi Jinping’s leadership by international society has never ceased. He has remained a focus of international discussion, a topic to be followed, a priority for research. Up to now, along with a number of major historical moments that have enriched China and impacted the world — the Party’s 18th and 19th congresses and various plenary sessions, focussing on the governance practices of the Party, the APEC Summit, the G20 Summit, the Davos Forum and other major events, and the overseas visits of General Secretary Xi Jinping — the praise for Xi Jinping’s leadership by international society has been grown day by day, repeated constantly. This sort of sustained praise for a national leader is something rarely seen. Fourth, there is the broad [geographical] scope [of praise for Xi Jinping]. Conscientious search and gathering, and systematic sorting, reveals that from the standpoint of geographic coverage (地域覆盖面), praise for the super-strong leadership of Xi Jinping from international society covers the entire globe. It comes from the United States, from Great Britain, Japan, Germany and other developed countries, and also from the vast majority of developing nations in Asia, Africa and Latin America. Since the 19th National Congress of the CCP, the Chinese Academy of Governance (国家行政学院) [within the Central Party School] has held many study events for overseas officials. More than 240 mid and high-level officials from 40 countries spanning Asia, Europe, Africa, Latin America and Oceania have expressed enormous admiration (极大赞赏) for the marvelous (极不平凡) and historic achievements made since the 18th National Congress of the Chinese Communist Party [in 2012], and generally believe that General Secretary Xi Jinping has shown superlative leadership wisdom (高超领导智慧) and been a model leader in promoting socialism with Chinese characteristics and world peace and development. Fifth, there is a wide variety of people [praising Xi]. Looking at the praise overall, those in international society praising the leadership of Xi Jinping . . . include not just overseas politicians, well-known scholars and journalists, but also include well-known leaders from businesses and social groups, and also overseas Chinese. At the same time, they include international publics and internet users. Commentaries and praise of Xi Jinping’s leadership mostly appear on social media and in online comment threads. Among these there are people who are familiar with China and who research China, and also people who have come to be interested in China, and to research and understand China, through their interest in Xi Jinping. There are people in their 80s and 90s, and those who are just 16 or 17 years old. Sixth, there is the level of praise (赞誉程度高). Many international figures have offered extremely high level of praise of Xi Jinping. When General Secretary Xi was on a visit to the Netherlands, Mark Rutte, prime minister of the Netherlands, gave a heartfelt sigh: “China chose an excellent leader! Only an excellent leader like Xi Jinping could properly govern a country of China’s size, successfully resolving its various internal problems.” Former United States ambassador to China John Huntsman characterized Xi Jinping’s leadership as “unprecedented,” saying that he was the Chinese leader since Deng Xiaoping most vested with transitional character (最具转型色彩), and that he had earned widespread attention from world leaders. Former Mongolian President Tsakhiagiin Elbegdorj used a single Chinese character, “strong,” to express his view of Xi Jinping. He explained that “strong” could mean many things, including a strong capacity for work, a strong capacity for leadership, a strong ability to create cohesion, etcetera. . . .
Former German Ambassador to China and BMW Foundation chairman Dr. Michael Schaefer has said that one can see through the series of speeches Xi Jinping has made since becoming General Secretary of the Central Committee of the Chinese Communist Party, that “Xi Jinping is an extremely great leader,” and he can surely create an even brighter future for China and the world. Yuri Tavrovsky, a China scholar and political commentator who is a professor at the Peoples’ Friendship University of Russia (RUDN University), believes that “an extraordinary leader has emerged in China.” America’s Time magazine listed Xi Jinping among the top 100 most influential people [for 2017]. NextEnd Times for the Chinese Newspaper?